Am I doing it right? 19 trains. Thread: Am I doing it right? 19 trains. That pretty much eats up all my training points right now. I'm planning to throw in eventually 24 ranks of ambush before 50. Probably bring up climbing and swimming with extra points. Not really sure if I'm doing this right either. What other shield specs should I be considering? Nothing trained here yet...what's good? Last edited by Methais; 09-12-2018 at 12:43 PM. What was your reasoning for blessings over religion? Surge of Strength for combat maneuvers, Armored Fluidity for armor specialization. Other than that, I don't know the nuances of shield paladins, so I'll leave that alone. There are essentially two ways to optimize a paladin. You are either a tank and get a big ole shield and never get hit and kill a little slower or go all out offense with a pole or two handed. It looks like you want a tank so build accordingly. Mine is an mstriking naginata using whirlin dervish. But he gets smacked a lot too. I'd drop the blessings lore in favor of religion lore. I'd personally also drop a spell rank and take your paladin ranks to equal level. 101 and 103 are cool but you can get those from anyone. I keep most of my semis at level with spells to start to save points. Plus you want to be getting your sanct weapon by level 30 no question. If I were you I'd not stop in MOC. I rushed the 30-35 ranks needed for multistrike, which I think is a really good thing to do when you swing a one hander. Just my preference though. Another thing to consider is using CMAN points for shield bash until you have enough shield points later on to do both that and all the other things you want. 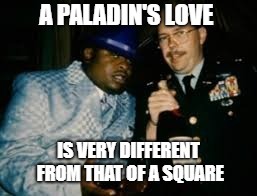 WSPEC is kind of meh, you're a paladin your AS is already ridiculous. Last edited by Nosh; 09-30-2018 at 09:08 PM.